She says a CPS caseworker called her on Monday and told her to come to Texas Children's Hospital. “All they told me was there was a little accident,” Hernandez said. “I get here and they told me my daughter had head trauma and severe brain damage.” Hernandez says CPS entered her life after the police were called to her home in 2014. Her youngest son who was one at the time had marks on him. 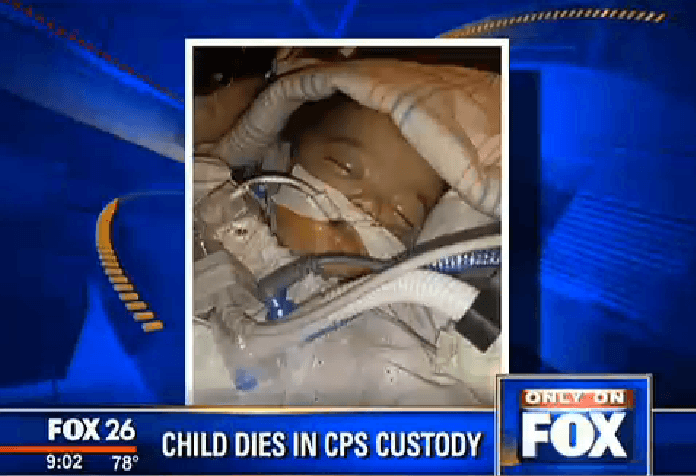 He and his older brother were taken into protective custody by CPS. The youngest boy's father CPS says was convicted of abusing the boy. Hernandez was not suspected of harming the child. Still after her baby girl was born CPS swooped in. “She was removed from my arms at only 3 days old and put into foster care with the same home,” said Hernandez. Hernandez says she begged CPS to place her children with family members. If that would have happened the grieving mother says her baby daughter would be alive today. These evil monsters have to be stopped. So heartbreaking and sickening. DCF used to do what it was supposed to which was save abused children. Now it's turned into an adoption. Program as the federal government gives them money for adopting out a certain amount of children a year since the late 90's. It's a corrupt evil system where a parent is considered guilty right off and loses all their civil rights and perjury is committed in court by DCF to steal these children. I'm praying people will start realizing what's going on and help reform this terrible corrupt organization who are in all reality are the real child abusers. They put children in horrible foster homes where they are abused and neglected smh :(. The disabled children especially are a big target. These EVIL people MUST be put in JAIL. I agree and our jails and prisons would be full of DCF worker's as the majority of the people lie and steal children from good homes. I witnessed it so know it's real. It's horrifying. CPS needs to be abolished they harm more kids then they do good for..
How on earth could they let a baby lose 10 lbs? That was probably over half the infant's weight. What a nightmare. And this beautiful child that passed away... her mother deserves an apology and profound respect. This child was the casualty of a sick social experiment. When I got the Napster there was always some kid dying in foster care. I don't know where they get these people. Because every child they take into foster care the government gets federal funding. My friends son was in Foster care in another state and was given a baby bottle with baby food in it. He lost 10 lbs before the foster parents were charged with neglect. Why there were many calls about this abuse and they ignored it.... Lucky his dad has him back in his custody from false abuse charges. He could have been another statistic..... Our government needs a big cleaning of house. Stop blaming all the parents that actually care about their child, hold responsible the people who hear one complaint and don't investigate the situation until they have already pulled the child into a strangers arms. This baby needed her mom...if dad was the abuser which it maybe not true but if so don't take the child from the mom especially that low. Take the abuser out of the home instead. Give to a family member at least. Most states have laws you're not aware of that state in their law to find a family member first like grand parent, sibling of parents. Look in fine print you may have a case against CPS. CPS and the government are taking kids left and right and not just from abusive homes. If they feel like it--they will take them because they have unilateral power. Their word trumps all others--even if those words are lies or mixcharacterizatons. These workers do not have training in personality disorders. They listen to people who are often using the system to get back at someone. The angry spouse or partner so they make up allegations and they use the system to further the abuse through the courts. I SINCERELY HOPE THEY FILE A WRONGFUL DEATH SUIT !! !